Here’s our latest interview with a millionaire as we seek to learn from those who have grown their wealth to high heights. If you’d like to be considered for an interview, drop me a note and we can chat about specifics. My questions are in bold italics and his responses follow in black. How old are you (and spouse if applicable, plus how long you’ve been married)? I am 52. My partner is 54. We met several years ago, both having been divorced and on our own for almost 15 years. We are very similar – one child each. We share similar sets of values concerning money and so we were both somewhat financially independent when we met in our late 40s. Do you have kids/family (if so, how old are they)? I have a 21 year old son. He’s a senior in college studying logistics/ supply chain management. She has a grown daughter – a corporate recruiter. What area of the country do you live in (and urban or rural)? We live in a mid-sized Southeastern city that is one of the fastest growing in the country. It’s urban. I spend part of my time in Asheville, NC — much smaller and near all outdoor activities I enjoy. Combined, we are worth a little more than $6 million. Since we each brought our separate money into the relationship (yes, she is a “millionaire” independent of me), we invest separately so that we can stay on point. Our approaches are different. She’s a market girl and I’m a real estate guy. We were almost automatically diversified. My net worth is approximately $3.5 million. My partner’s is around $2.7 million. What are the main assets that make up your net worth (stocks, real estate, business, home, retirement accounts, etc.) and any debt that offsets part of these? I don’t count cars, motorcycles, bicycles, or musical instruments. Nothing fancy there. I own a risk management company. I’m also a registered rep. for investments. I am a real estate investor — mainly for fun — more on that later. My partner works for a large bio-tech company out of San Francisco. She has an MBA and a nursing degree. Perfect training for what she does. Tell us about your income performance over time. What was the starting salary of your first job, how did it grow from there (and what you did to make it grow), and where are you now? At 23 I went to work as an employee for the company I now represent as an owner. It was in operations / claims. Salary began at $22,500 in 1989. By the age of 29 I was making $60,000 – tough stressful work. At that point I quit operations and opened my own practice – self-employed. I gave up a pretty cushy corporate operations job with great benefits, a company car and a promising future. I opened my agency at the age of 30. My income went backwards to $28,000, then by 35 I was making $100,000. By the age of 40. I was making $185-200k. In my early – mid 40s I brought home $250,000. I’ve been earning $300k+ for about 5 years now. For the first few years of building my business it took an almost singular focus. I went through a divorce at 34, getting shared custody of my 4 year-old son. It was a tough busy time. I’m grateful that the job afforded me the time to be with my son when he was young. Building the business was hard but I never missed a game or a campaign JG trip or school function. My partner had a similar experience. She’s always made $150k+ with a company car and bonus. She’s also very frugal and has kept a good portion of her earnings each year. She’s worked for only 3 companies since she left nursing. All were in biotech/ medical. She’s exceptionally bright and disciplined. I’m a lucky guy. What tips do you have for others who want to grow their career-related income? My original job as a W-2 employee paid well with benefits. Growing that income was not possible beyond doing a really good job and getting scheduled raises. I worked hard and got promoted. That said, going to work for myself was the single best professional decision I’ve made. It would have been easier to stay put in my corporate gig and not take the risk. So maybe my advice is to look outside of the comfort zone and take calculated risks. Occupation choice is such an important part of growing income. My real estate was accidental. I made a couple of good decisions in my mid 30s that paid off. I bought a house in a great area — an old 4 square with 2 kitchens and an exterior entrance to the upstairs. I rented out the upstairs and my son and I lived below (at no cost – their rent paid my mortgage). That allowed me to buy a small office building for my business. I later bought rental property with my son’s earmarked college money. The profit from those two little houses paid for his college. Real estate can be a really good play to complement career-related income. The tax benefits are outrageous! What’s your work-life balance look like? I am very grateful. At 52, I do what I want to do when I want to do it. This has been going on for about 6 years since I was 45-46. My income is 95% passive for both real estate and insurance. I have great employees and I spend time coaching them and visiting with clients over lunch or coffee. I no longer keep a personal office at work. That space is better used for employees. I spend 3 weeks at home then spend 2 weeks away at my little mountain house. We enjoy the outdoors. I ski in winter — I usually get in 20-25 days. (Not bad for a fly-to skier). I love riding my mountain bikes or dirt bikes or just being in the woods. We have dogs and spend time with them. I visit my son who is away at school. I miss him so much. When I was 34 I was sitting in a coffee shop in Atlanta on a Monday morning. I was recently divorced and somewhat out of sorts, rushing home to my new struggling business and my 4 year old. I saw these 3 healthy looking 50-something guys having coffee together. They were tanned and looked happy. They were laughing – didn’t seem rushed. I remember thinking “I don’t know what those guys do for work but that’s where I wanna be one day”. That’s me today and I’m so grateful. Do you have any sources of income besides your career? If so, can you list them, give us a feel for how much you earn with each, and offer some insight into how you developed them? I’ve mentioned the real estate already. We will do about $85k in 2019. Did $50k in 2018. My next-step goal is to make $120,000 in passive profit. I enjoy finding good deals in emerging areas and using the “value add” to increase profit. We have maybe 10 doors not including personal residences. The properties are primarily neat/ tidy single family houses near the city center. I’ve found real estate to be a perfect complement to my “main occupation”. The appreciation on the asset is good. The income has been good. The depreciation of the property works well to offset earned income. We recently used a 1031 exchange to protect a $900,000 gain we experienced in selling our previous office. Our new office is brand new and has a space that we rent out. I just enjoy real estate. The local market has been very good for us. I’m currently searching for a 30+ multi-family. We will see. I still want to keep my income mostly passive and I find myself working more on these projects! But again, I enjoy it. What is your annual spending? Expenses are $90k so I have to earn $110k to cover that. This doesn’t include saving/ investing. This will be reduced once my son graduates in May. What are the main categories (expenses) this spending breaks into? We enjoy eating out but rarely spend over $50-60 per meal. We enjoy travel but usually attend work related conferences or real estate scouting trips that allow us to recreate. Our cars are both business vehicles. Hers is provided. Mine is paid through the business. Do you have a budget? If so, how do you implement it? We categorize and stick with it. We are both frugal so it’s no big deal. We do not do without anything though. It’s really all about having discerning between “want” and “need” and keeping wants in check. The key for me was having adequate enough allowances in each category so that I didn’t feel “pinched” each month. I always fall beneath my allotment in each category. What percentage of your gross income do you save and how has that changed over time? What is your favorite thing to spend money on/your secret splurge? I enjoy riding/racing bicycles and dirt bikes and skiing. I will splurge every 3-4 years on a new bike – or a new set of skis. Just put a new kitchen in the house. This was a 15 year “put off”. When my rental properties had better kitchens than my own kitchen, it was time. She reminded me of that. What is your investment philosophy/plan? Reduce expenses where you can. Do a little even but do it consistently. What has been your best investment? Small office building purchased in 2005 for $300k just sold for $1.2 million. I was able to owner-occupy with my business. It was purely luck. We were acquired by a clinic in a land grab to build a new building. What has been your worst investment? I opened a retail store in 2005 that did well until the 2008 downturn. We were forced to close in 2010. It was one of the single worst experiences in my life. I was forced to wind-up the business — negotiate with vendors, bill collectors, bankers. It was a very scary time. I lost a substantial amount of money that I couldn’t afford to lose. I got through it. The experience conditioned me for taking measured risk in my other businesses. Oddly that horrible experience is a great point of reference for me now if I’m feeling fearful or things aren’t going my way. What’s been your overall return? With tax savings, maybe 12%. How often do you monitor/review your portfolio? Probably a couple of times each week. We don’t pay much attention to the market stuff. It moves around. I pay more attention to cash flow projections and looking for properties. How did you accumulate your net worth? No inheritances for me. My partner inherited $300k last year from her mother’s estate. We happily live below our means. We’ve always lived on a budget. Neither of us spend money on things we cannot afford. As a young man I read The Millionaire Next Door and adopted those frugal principles. I drove older vehicles but took care of them. Until 6 years ago I drove a 1997 Toyota Landcruiser that I bought for $17k. She has always had a company car. We saved the money we would have spent on expensive cars. Since I was in my late 20s I’ve kept at least 6-12 months of expenses in a cash account. Having money in the bank and low expenditures has given me the ability act when lucrative opportunities present themselves. That has been key in some of the real estate that I’ve accumulated and the consistent market investments we’ve made. I’ve been lucky to surround myself with good accountants, attorneys etc. Being able to take advantage of tax laws is a HUGE part of growing wealth. Even the little bits add up – SEP contributions – HSA contributions – strategic spending on equipment etc. Having a “team” to help is vital no matter how much money you have. Philosophically I have always enjoyed growing my net worth more than spending my earnings. Also I have a healthy fear of being broke. I’ve been fortunate to keep the company of like-minded people and I met a like-minded girl a few years back. She’s great. I have nice things – a nice guitar, a nice truck, a great bicycle. I pay for my son’s state school education. I give to charity. We both get a bigger kick out of being active and on our bikes than buying the latest greatest new object. One more thing. We have many friends and many don’t have the same financial means as us. It’s nice to live in a way that nobody really knows about our finances. It’s entertaining to watch others do that though. What would you say is your greatest strength in the ESI wealth-building model (Earn, Save or Invest) and why would you say it’s tops? We have been sort of equal in all parts maybe. Saving is key though — no matter what you make, save a little. What road bumps did you face along the way to becoming a millionaire and how did you handle them? I’ve previously mentioned divorce and closing a business. Those were tough. In my late 30s I was forced to face a drinking problem that had quietly crept into my life. No arrests, no visible damage to the outside world. Addiction doesn’t always march into the front door and make a pronouncement that it’s arrived. It creeps in and manifests in depression and isolation. I had this awesome life and I was missing out on the moments. I’m grateful that at 40 I got sober. I only share this to show that there’s no shame in it — stigmas kill people. This “bump” turned out to be the best thing that ever happened. My son has no real recollection of me drinking. I’m so grateful. What are you currently doing to maintain/grow your net worth? I just try to be consistent. I’m always working with my team at work. I listen to podcasts on investing — mostly real estate. I try to buy at least a couple of properties each year. I’m about to join an entrepreneurial focus group in Toronto to stay sharp. Do you have a target net worth you are trying to attain? Great question. I don’t plan to retire — I sort of have the life I want. We discussed how much was “enough”. Not sure. I have a new charity that I’m passionate over. I just want to continue with good activities and the money will take care of itself. I can’t control markets. I can control activities. How old were you when you made your first million and have you had any significant behavior shifts since then? Lol. Ok this is funny. I bought a 7 year old Porsche Carrera C4. 28k Miles. Flew to Vegas and drove it home through Utah / Colorado. Great experience. I kept it for 2 years and put maybe 5000 miles on it. It sat in the garage mostly. My dog couldn’t ride in it. I couldn’t take my son fishing in it. I’d get mad when he put his feet on the dash. It was TINY. I sold it and have had a truck since. I don’t miss it one bit. But otherwise no changes in behaviors. What money mistakes have you made along the way that others can learn from? Don’t get distracted with shiny object syndrome. Focus on one or two things and put your money into that. Diversifying investments is good but get really good at a couple of things. And never open a retail store. What advice do you have for ESI Money readers on how to become wealthy? Read “The Millionaire Next Door” — “Rich Dad, Poor Dad”. Get a good mentor and tax accountant. Understand the power of compounding interest. Stay fit and active and take care of your health. Hang around people who enjoy what you enjoy. It’s good for your brain and body. My biking keeps me grounded because my buds and I like bikes. We don’t care about Ferrari’s. A bike probably won’t break the bank — even though they cost $6-10k now. Don’t assume that “you can’t”. Try it. I wanted an office building for my business. We settled for a small house and converted into an office. It was a stretch financially. A client of mine encouraged me to “do it, just buy it”. I couldn’t believe that I was able to have a building in the location I found this one. Amazing! We sold for a huge profit and I have a better building! And it’s paid for. The point is that you can. Eventually. But you have to try. What are your plans for the future regarding lifestyle? I’m not likely to retire. I’m currently working on creating the lifestyle I want. I’m continuing to staff up so that my daily responsibilities are less. My girlfriend will retire in 5 years and I want to spend time away with her. We may travel or spend more time in the mountains. I really enjoy things as they are. I want to stay healthy and stay sharp and I will reevaluate retirement along the way. I hope that my activities will stay the same. 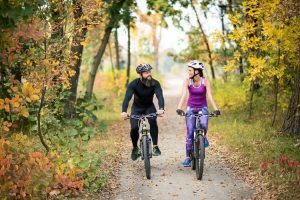 We should still be able to cycle and ski and hike. It’s more about going long than going BIG now though. I don’t want to get injured. I broke my leg and tore an ACL on that same leg 18 months later. That was tough and got my attention. How did you learn about finances and at what age did it ‘click’? Was it from family, books, forced to learn as wealth grew, etc.? My father was always horrible with money. Although he made an adequate income, he’d spend it all. He couldn’t manage money. I’ve always been fearful of not having enough so when I got my first job, I guarded my money. Who inspired you to excel in life? Who are your heroes? I’ve had a lot of help along the way. Too many mentors to mention. Thomas J Stanley and his series of books were huge for me. Sadly, I never met him but I was recently quoted in the new book. My heroes walk into our offices every day. I see single moms just killing it and raising kids or elderly clients who talk about The Jim Crow South and growing up here then. I’m so inspired by my friends who’ve actually had challenges that are almost unimaginable. I was raised very simply without much extra but I have never experienced certain injustices. These are my heroes. Do you give to charity? Why or why not? If you do, what percent of time/money do you give? Yes. I need to do better with time. She loves the animal shelter. I love the clinic next to my office that provides healthcare for the working poor. We also like being a part of our neighborhood indie theatre. Do you plan to leave an inheritance for your heirs (how do you plan to distribute your wealth at your death)? What are your reasons behind this plan? I’m hopeful that there will be plenty. We don’t intend to spend much differently in retirement than we do now. Adding real estate will hopefully increase passive income in addition to our IRA savings. That should allow me to leave a financial legacy. There will be some for the charities. I plan to leave the real estate to my son. If the tax laws stay the same, the real estate will transfer nicely without excessive tax consequences. Additionally I will leave a fairly substantial life insurance plan to my son. That money is not taxable. My girlfriend will leave her remaining money to her daughter as well and it’s likely she’ll pass some along to charity. Thanks for sharing, you are inspirational. This one was interesting, sounded like a real person. Thanks for the interesting interview and cogratulations for your achievements! Can you recommend any podcast about real estates? Hey Jakub. I like “ Bigger Pockets”. There’s a lot of information there and so there is something for everyone. They are super upbeat and the focus is real estate in general. I also listen to Michael Blank -“ Multi Family Investing”. There’s another one called “ “Old Dawgs Guide to Real Estate Investing “ with Bill Manisaro. All of these guys have great guests and take practical approaches to the different stages of RE investing. I’m still a newbie but I get so much out of all of these guys. First though I would encourage you to read Gary Keller”s “ The Millionaire Real Estate Investor”. Great book that is available in audio or paper. Can you please expand on some of the tax advantages made possible by your real estate investments? – Succesion planning – Being able to pass real estate along to heirs at a “stepped up basis” is a primary concern of mine. Great way to preserve wealth for generations. -Depreciation – Single family homes have an active depreciable schedule of 27.5 years. This must be recaptured at the time of a sale but offers an immediate write down on each property. Having multiples makes it better. This is a direct write down that goes against a Schedule C income. As a buy and hold investor this is beneficial. – Write downs on all expenses including refinances, betterment, general expenses etc. We can make the property nicer for better value and increased cash flow and also get a tax deduction on the expenses. – Repositioning The Loans – investors can refinance and pull equity (cash) from the investment and it does not create a taxable gain. A rising market will increase equity – owners can refinance and pull all of the money invested originally and buy another property. Expenses to refi are tax deductible. This can impact cash flow so careful here. We like to keep a min 40% equity stake in each property but I still average around 65%. – Many of the “things” I buy do double duty. My utility trailer, truck are tax deductible and used for work. As a self employed wage earner, real estate allows a place for me to augment my cash flow and take advantages of tax laws at the same time. I qualify as a “real estate professional” designee now because my primary occupation is passive and allows me to spend the required hourly minimum doing real estate -managing properties and scouting new ones etc. Very complex formula but the two occupations compliment one- another. Tax advantages are very good under that designation. I noticed a couple of things in this article that confirms a few things about many of us with a relatively high household NW, say above $5M. We are more likely to be business owners and do some sort of real estate (I also entered real estate leasing accidentally). As business owners, we can contribute more to IRA’s (up to $55K/spouse 2019) and have tax efficiencies associated with business ownership and real estate loans/depreciation, property taxes. We also seem to have the opportunity to trade work for free time and serve our customers as we want. Thus it seems we are more likely to live the lives we want today and not be so anxious about early retirement, further improving our relative financial standing. Even though business ownership comes with stress and longer hours in the earlier years, there is a light at the end of the tunnel of better income and the satisfaction of building something yourself from the ground up. Hard to explain until you are doing it. Thank you for a great interview! Very simple (yet deep) and inspiring. Our favorite car was our 1987 Landcruiser – still miss it! Especially great: “I wanted an office building for my business. We settled for a small house and converted into an office. It was a stretch financially. A client of mine encouraged me to “do it, just buy it”. That has been a dream of ours for years, and you re-inspire me to see how to get it done! I’m currently attending ADISA conference in San Antonio, TX – hopefully I’ll learn something. I don’t do much of that any longer. The market is a strange thing. There is a very large transfer of wealth on the horizon with the baby boomers. I think your timing may be very good. To be objective , I no longer manage my own money. I have a guy who looks over the SEP. my girlfriend has a market guy she is comfortable with as well. I’m capable of doing this but I firmly believe that emotion plays very heavily into market investing and it’s no place for emotion. I will say that the best money managers manage “behavior” rather than money. Most people are not very disciplined and I think that a good advisor can there. Hey buddy, I think your experience bears some resemblance to mine. Just like you, my father is horrible with money. He makes big money but he would lose it to gambling, drinking and big spending. Just like you, I have a healthy fear of being broke and I am more interested to build my net worth rather than spend it away on big ticket items. Just like you, I am a big lover of real estate. Close to 90% of my portfolio is in REITs (diversified across geography and industry though). One question close to my heart is whether I should rebalance my portfolio so it is less heavy on real estate (although I believe the REITs’ cashflow/source of earning is relatively well diversified). Can you share with me whether you encounter similar concerns in your investing journey and how do you address it? I dont personally do REITs because they don’t have the tax advantages of straight real estate investing. ( they probably don’t have the headaches either). That said, I don’t know enough personally about them to guide you. Diversification is always good. In my world though that cash flow is important. Cash isn’t king rather “cash flow” is king. Take a look at straight real estate investing and it might actually offer some diversification for you. That said, remember this – the “ real estate market “ is not ONE market. There are so many sub markets that act independently of one-another. The economy and legislative activities can affect each sub market differently so I try to stay in markets I know – specifally zip codes I understand. That can take time but that understanding reduces my risk. One of my favorite interviews, it was such a pleasure to read, i love the following the best and can relate to. 1)I do what I wan to do when I want to do it! The true financial freedome is when you have 100% control of your time, no one can tell you what to do! 2)95% passive income is awesome! I am at 70% right now, still got work to do. But even with my real estate, it’s not so “passive” because I still have to manage the tenants. 3)I also love reading, a book at week. Books on millionaire mentality, self discipline, and staying motivated are my favorites Also traveling to new countries every other month if my goal! 4)Your 400% profit on the small office building is awesome!! you got in early and at the right time, good for you! 5)”Having money in the bank and low expenditures has given me the ability act when lucrative opportunities present themselves. That has been key in some of the real estate that I’ve accumulated and the consistent market investments we’ve made.” I love this! I also save as much as I can, so if I see a great deal, I can go right in and scoop it up with cash! 6)”I just try to be consistent. It’s great to see someone with so much in common, thanks again for the great read Sir! Chris on All about Coin Collecting: Is It an Investment or a Hobby?